Shrouded House is designed to accomodate a maturing family, and respond to their changing needs of occupation, from individuals, to their teenage children, to extended family. 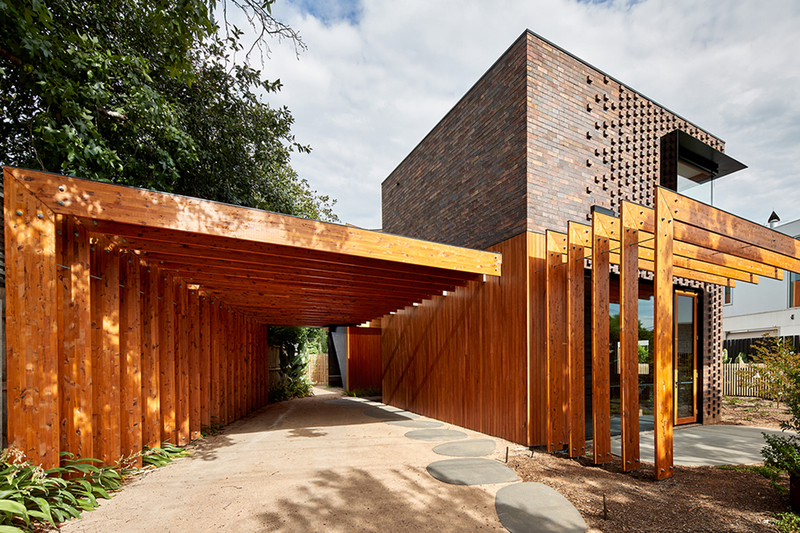 Shrouded house features timber extensively, both in external and internal applications. Timber is used as a warm juxtaposition to the heavy masonry application that makes up the bulk of the other materials. The light timber contrasts both texturally and in colour, whilst bringing a lightness and playfulness against the heavy brick and concrete. 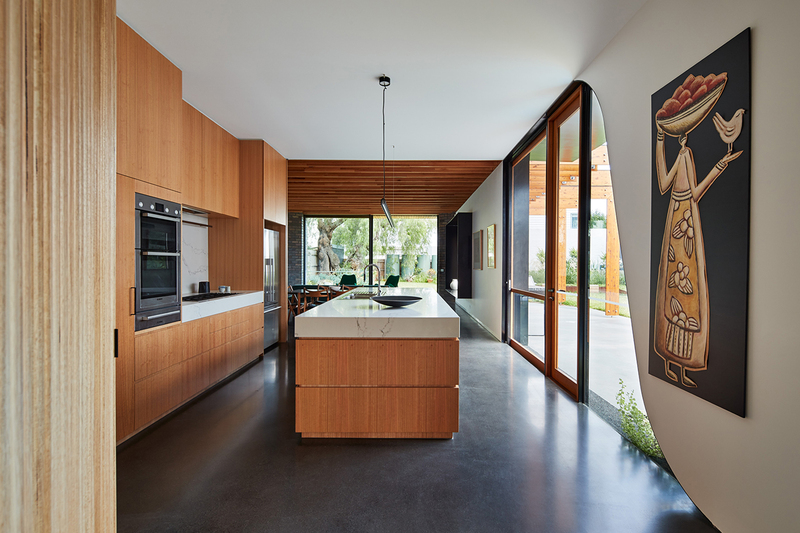 The programming of the house is designed to maximise natural light. Circulation spaces are kept to the central core, whilst habitable spaces are kept to the exterior walls. Large openings on the north facade maximise light to habitable space, with skylights providing natural ambience to the circulation spaces. Formerly the site of a single storey California bungalow, the new residence utilises only 50% of the original footprint, but maintains the same internal area, maximising outdoor spaces. BKK were the architects of the project, while ACOR Kersulting provided engineering consulting and Grenville Architectural Construction were the projects builders. 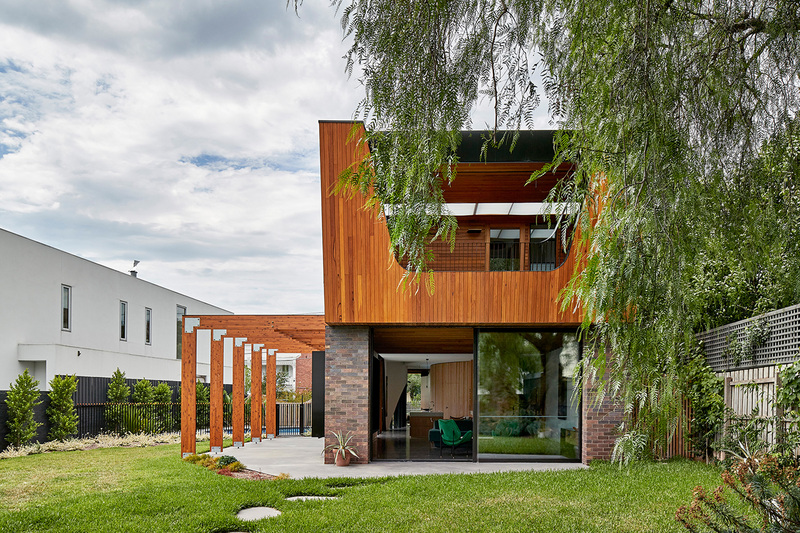 Shrouded House is a continued exploration of the nature and language of space by BKK Architects. The design prioritises liveability and programming of space, rather than ‘architecture as object’, which can fail to address practical design. The house is designed to adapt to the changing needs of the clients, who have teenage children. The space can accomodate the clients, their family and extended family, all with equal ease. 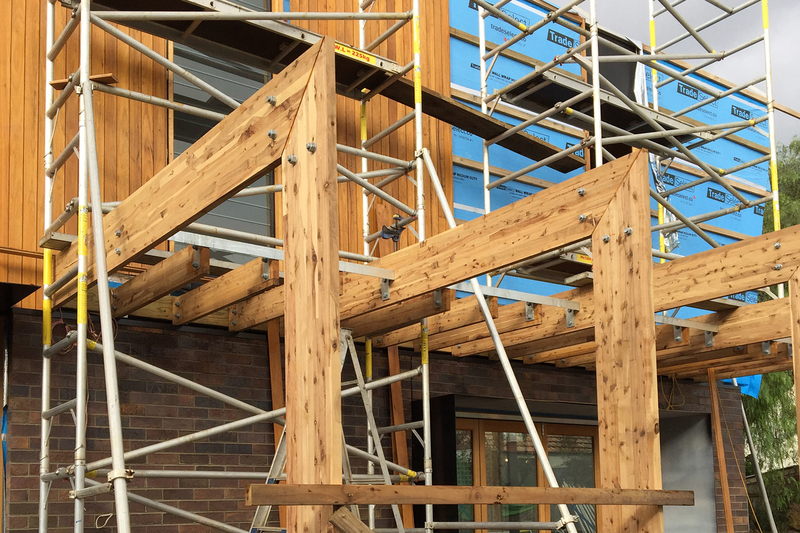 Structurally, Shrouded House relies heavily on engineered timber products. The floor system is comprised of Glulam joists and bearers, while the rafters and roof system is made from LVL beams. Wall elements are mainly masonry construction. The external pergola is also constructed from Glulam beams. 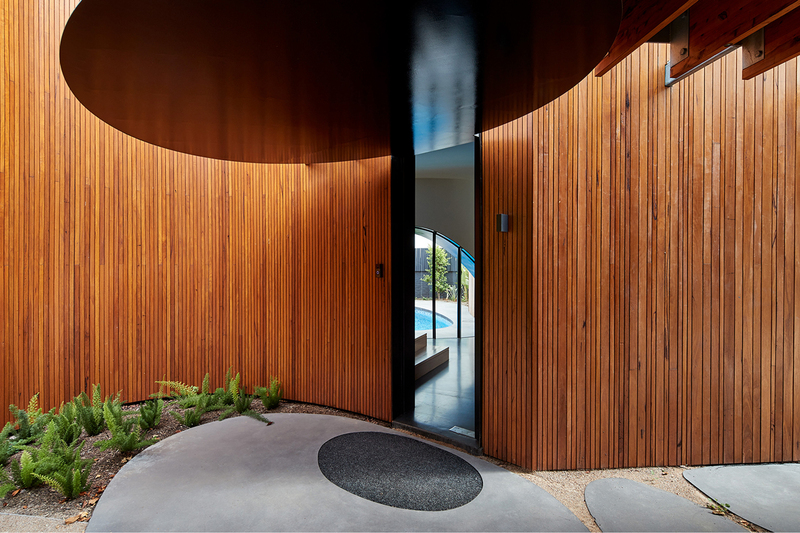 The existing timber fence on the property featured a curvilinear form, which was exploited by the architects, and used as a starting point for a curvilinear motif throughout the residence. 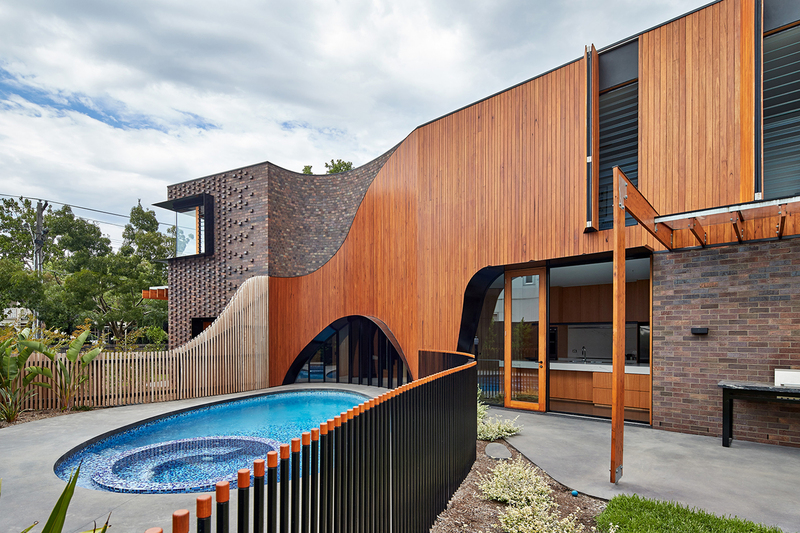 The curved line is continued around the edge of the pool, before dramatically sweeping upwards into the facade, occasionally revealing rugged brickwork behind the timber cladding. The same technique is used to reveal window openings dotted throughout the facade. Cladding on the exterior of the structure and fencing is shiplapped silvertop ash. An outdoor living room on the first floor is both deck and living space, and is entirely clad in dressed silvertop ash. 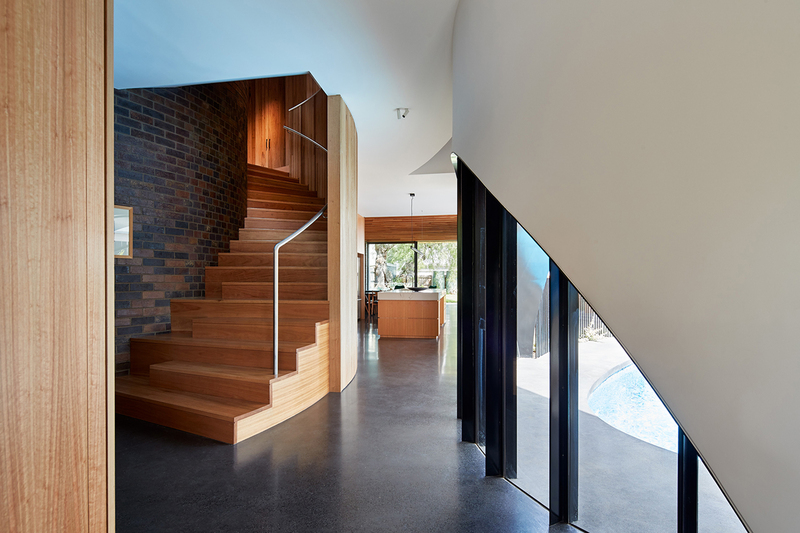 The curved motif continues throughout to the interior the residence, forming the main feature element of the entrance; a curved timber and brick wall forming a grand staircase. Exposed timber beams are a recurring aesthetic element of the interior spaces, particularly the generous downstairs living spaces. 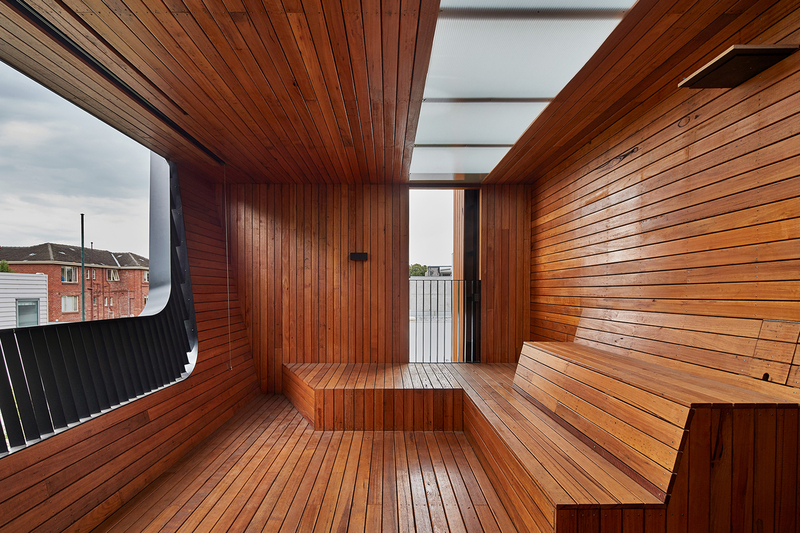 Timber clads one side of the first floor hallway, meandering through the house and fully releasing outside, fully cladding the covered outdoor living space. Wall lining is silvertop ash, and the stairs are constructed from blackbutt.